The Mobile Arts Council Artist Directory is a publicly searchable listing of member artists who live and work in the Mobile area. Browse by artist name, discipline, and view current contact details. To list your event on our website, click the button to the right and fill out the form. For questions about the Community Calendar of Events contact us. Sign up for ArtStart, our weekly collection of all arts events delivered straight to your inbox. The Mobile Arts Council is pleased to share all current opportunities for artists that have been submitted to us. This list is emailed to MAC members every other week of the month. Please contact the organization listed if you have any questions. Artist opportunities may be submitted through this form. Want to receive these emails? Sign up to be a MAC member! Callig all artists, crafters, and local vendors. Come sell your stuff at the Christ United Spring Bazaar on April 6th from 9 AM - 3 PM. Register online today! 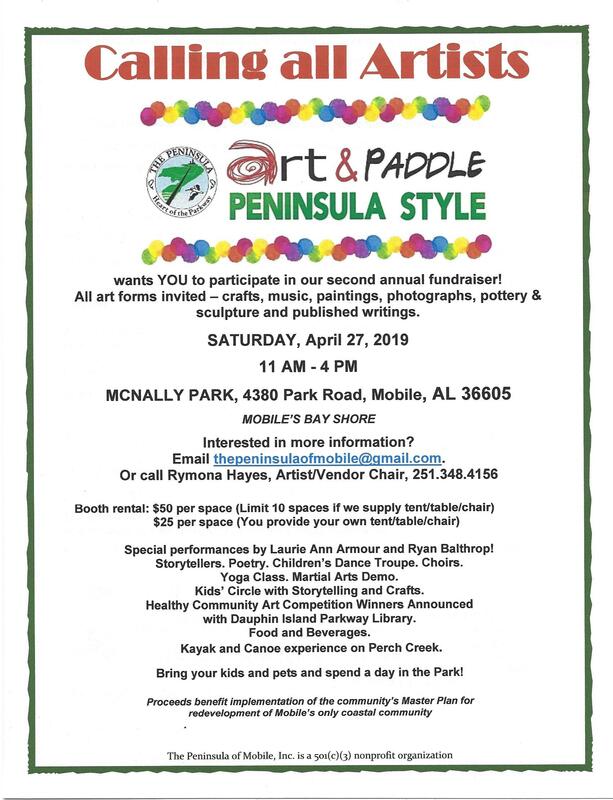 Art & Paddle Peninsula Style will take place on Saturday, April 21, 2018 starting at 10 AM at McNally Park on Mobile’s bay front. This FREE family-friendly fun day on the west bay shoreline aims to raise awareness of Mobile’s waterfront while participants enjoy great music, art and a quiet, picturesque paddle through the eastern section of Perch Creek hosted by Dog River Clearwater Revival. Artists, writers, and craftsmen are invited to set up as vendors during this event. See the event flyer for full details! Round But Square Studios is seeking arts and crafts instructors to share their talents! Whether you paint, college, tie-dye, arrange flowers, decorate, knit/embroider or possess another crafty talent, the studio can offer you the space to teach your skills to students of all ages. Round But Square Studios is an art studio that seeks to inspire creative thinking, develop artistic skills, spark curiosity and promote self-expression and creative confidence. The studio offers art classes, creative workshops, camps and birthday parties; from toddlers to the very wise! Please visit the website or email roundbutsquarestudios@gmail.com to learn more on how you can get involved! Each year, the Alabama State Council on the Arts awards Artist Fellowships of $5,000 for artists working in crafts, dance, design, media/photography, music, literature, theatre and the visual arts. They also offer Fellowship In Arts Administration of $5,000 each year to an arts administrator to improve his/her skills and ability to serve the organization and the community. Visit their website for applications and additional details! Stewart Heath Gallery is looking to create a creative space on the Eastern Shore that goes beyond your run-of-the-mill gallery. If you are an art, yoga, meditation, dance, or music instructor, this is a beautiful space for class rentals. There are two spaces available for classes: the front gallery space and a private working space in the back area. The space is available Mondays 6 AM to 9 PM, Tuesday-Saturday early morning for private sessions, and anytime after 5 PM. The smaller private back room space is available anytime. If interested, reach out to the gallery at 251-270-1154. You may also contact Andrea Powell Walker at Andrea@divinemoxie.us. The market at 5 Rivers Delta Resource Center will feature local, handmade arts & crafts, and locally grown farmer’s market items. There is no fee, but donations to the Friends of Five Rivers Fund are appreciated. A one time application and a photo or online view of your sale items is required. Attendees must RSVP for the market dates you plan to attend no later than one week prior. Apply online today! Alabama Hues strives to foster imagination and creativity in their studio by helping students create beautiful art. Studio is available to book on day-by-day basis. Visit their website for additional information, or call Bill Appling at 251-973-8667 or email bill@alabamahues.org. Every other month, a different MAC organization will host all members of the community at a FREE networking event featuring refreshments, entertainment, and community-driven networking. We are currently booking Art After Hours for 2019. If you are interested in hosting an AAH event, email Lucy Gafford, MAC Programs Director. Candlewood Suites has room to display posters and flyers for local happenings in their lobby. Call 251-690-7818 or email Hillary@candlewood-mobile.com for additional questions. Candlewood Suites on 121 North Royal Street, Mobile, AL 36602. Shared creative work space is available at Central Presbyterian Church! 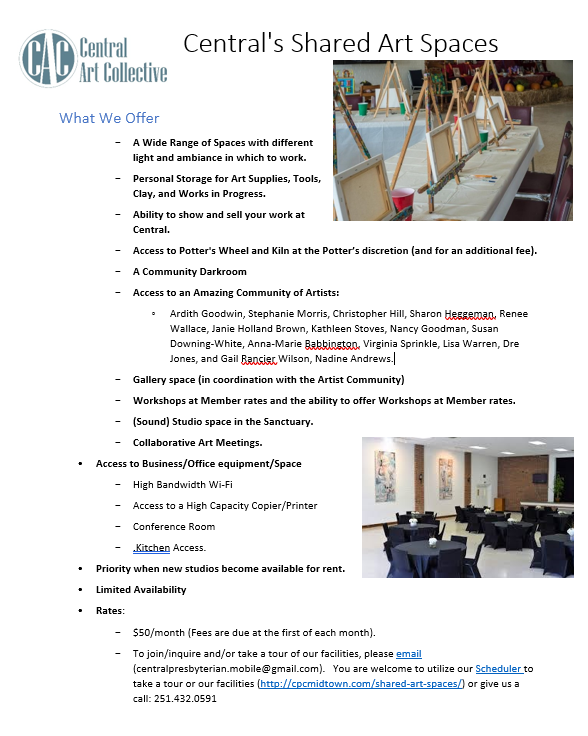 In addition to renting private studio rooms in the Church's buildings to artists and arts nonprofits, they now also have large open workspaces available. If you're interested, email Rev. Chris Bullock. The word out to ALL ARTISTS in the Gulf Coast region is that your names and your work can now be seen in an all-inclusive data-base. Sponsored and supported by Mobile Museum of Art, Mobile Arts Council and the Alabama Contemporary Art Center, the Artists Registry will be an outstanding resource for promoting the arts in Mobile and all communities along the Gulf Coast and beyond. The Artists Registry is designed to showcase local artists along the Southern coast in every area of the arts: music, visual art, dance, theater, needlework….all creative endeavors! The art community recognizes the importance of preserving for posterity the work of local artists and artisans who so essentially reflect the nuances of our time and culture. In addition, inclusion in the Artists Registry would provide a unique resource for possible exhibitions, programs and events to promote the many types of art that are being produced in our area. Please join by filling out the registration form! Local artists are encouraged to sign up as part of a network (an artist database) that will be shared between the Museum, the Mobile Arts Council, and the Alabama Contemporary Art Center. The goal is to make it easier to provide eager artists with jobs - including teaching, public art creation, professional workshops, and more. Find out what you need to sign up through the TAP checklist. If you want to sign up, click here. Showcase your work to wider audiences and further your involvement in the art world by submitting to the Aesthetica Magazine Art Prize 2019. Offering a $5,000 prize, publication within an inspiring anthology and exhibition space, this is an opportunity not to be missed for both established and emerging practitioners. Submissions are open from now through August 31st. Submit your work here! Entries are now being accepted for Mobile Bay’s 2019 Wooden Boat Contest! To enter, visit their website to submit a picture along with some basic info (to the best of your knowledge) about your boat. Winning entries will be professionally photographed by Mobile Bay Magazine and featured in their June issue! The deadline to enter is April 14th, 2019. Self-defined under-recognized visual artist 21 years or older are invited to apply for Visual Artist Grants trough the Harpo Foundation. Applications are evaluated on the basis of the quality of the artist’s work, the potential to expand aesthetic inquiry, and its relationship to the foundation’s priority to provide support to visual artists who are under-recognized by the field. Funding decisions are made by the Board of Directors, following review of applications by independent professional advisors. Awards are made of up to $10,000. The deadline to submit an online application for the 2019 grant cycle is April 19, 2019. The City of Gautier will be hosting its 3rd Annual Paint The Town Plein Air Art Competition on April 27, 2019 from 9 a.m until 4 p.m. A plein air workshop by Jerrod Partridge will be held on April 26th from 9 a.m. until 4 p.m. The cost is $50. There will also be a nature photography workshop by Robert Smith, Wildlife Mississippi, on April 27th from 9 a.m. until 2 p.m. for a cost of $35.00. For more information visit www.gautier-ms.gov or contact Chassity Bilbo at 228-497-8000 Ext. 317 or cbilbo@gautier-ms.gov. Interested in hosting a Public Knitting event? World Wide Knit in Public Day (or WWKIP Day) is Saturday, June 8th, 2019. Register online to participate! Join the Alabama Plein Air Artists for a weekend paint out at Bellingrath Gardens and Dauphin Island on April 13th and 14th. You do not need to be an APAA member to attend. Email host Jo Ackerman at joanneackerman@aol.com if you plan to register or have any questions. The Montgomery Art Museum has partnered with the Montgomery Art Guild to present a biennial exhibition of contemporary regional art in its galleries since 1960. We are pleased to welcome the art and artists of the 43rd exhibition to the Museum this summer. Juror David Reyes, Curator of Exhibitions and Collections at the Huntsville Museum of Art, will select between 80 and 100 works from approximately 400 entries by about 100 artists. Reyes has been at the Museum since 1994, working on over 300 major exhibitions at the Museum, including the prestigious Red Clay Survey, a recurring juried exhibition of contemporary art with more than 1,200 applicants from the Southeast region. Reyes has juried numerous regional independent art competitions, most recently the 2013 Dogwood Festival in Knoxville, Tennessee. All entries must be submitted by Saturday, March 30. Cash prizes are awarded for works judged exceptional by the juror. Apply online here! The Mobile Arts Council is now accepting applicants for our 2019 Market Events, including LoDa ArtWalk, SouthSounds Music Festival, and Market in the Park. Please review our 2019 Arts & Craft Market Guidelines before applying. Apply now through our website here! Stewart Heath Gallery is a new gallery at the Eastern Shore Shopping center (between Dillards and Belk in the outdoor mall). They are currently accepting artists to display their works, as well as renting out their space for events, classes, and more. If interested, contact gallery owner Stewart Heath at 404-822-3018 or email heathjordan@aol.com. The Artists’ Place at the Episcopal Church of the Redeemer serves as an arts ministry to the congregation and community. Their intent is to provide works of beauty and aesthetic power in areas of the church where people gather; to provide an outreach to the community by inviting them to display or view local art works; and to provide an opportunity for people in the community to become familiar with Redeemer and the Episcopal Church. View the exhibition information and agreement for more information! Salon West 54 Hundred is set to open their new “downtown” salon in Midtown on September 1st and are in need of artists. They have 60’ of gallery track with lots of available wall space and an artistic vibe. Commission on sales is 20%. Contact Whitney Vittor at (251) 662-8370 for additional information, or message them on their facebook page. Art Does It (ADI) is an Alabama non-profit with a Federal 501 (c)(3) charitable status, and a Board of Trustees–consisting of artists, business professionals, grant writers, and legal minds– formed in light of the recent need for a permanent artist exhibition space on Dauphin Island. ADI and the artists wish to call the former DI welcome center its home and to operate an artist co-op there. Visit their website to get involved with the gallery! Beginning Thursday May 10th, local arts and crafts vendors will join us in a monthly sip and shop night. Come out and peruse their work, see vintage and antique vendors with special sales, door prizes, food trucks and more! Vendor fee is $20, bring your own setup. Email alabamahues@gmail.com if you would like to participate. The University of South Alabama wants to exhibit your artwork! They have a newly renovated space upstairs in the Student Center featuring a hanging system over an exposed brick wall. Exhibitions can stay hung for at least 2 months, and the faculty will host a free reception for selected artists. If interested, contact Rachael Bolden, Associate Director of the Student Center, by email at rabolden@southalabama.edu or by phone at (251) 460-6196. The Mobile Arts Council is curating artwork for the Lost Garden (off Dauphin near the Downtown Mobile Alliance). 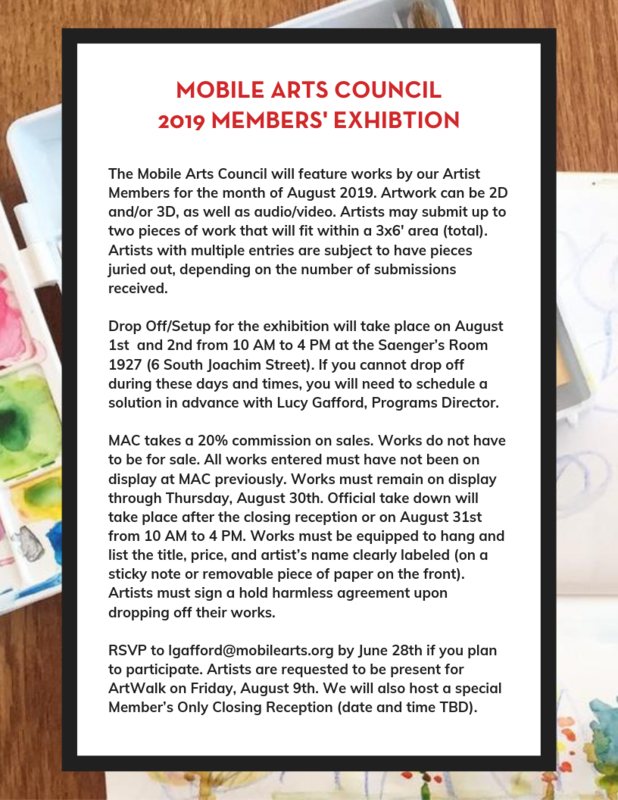 If you are interested in painting a permanent art panel for the garden, volunteering with maintaining the garden, or in being the featured ArtWalk Artist of the Month in the upcoming months, email lgafford@mobilearts.org. View the information flyer for additional information. Paint rocks and hide them for others to find! Join the facebook page and instagram group today. Paint rocks and hide them in places around Mobile and Baldwin counties so that others will find them. You can post hints of where to find your rocks or post pictures of you and the rocks you find. It's a fun, easy, and cheap way to add some smiles and share artistic abilities. O'Daly's would like to welcome all artists to set up at Dauphin St. Blues Company in a market style format. They can set up inside or on the sidewalk directly in front of O'Daly's. They will have live music and beer tastings. Artists would need to bring 100% of their own set up (table and chair) and if they need power they would need their own extension cords. The artists would keep 100% of all sales and commissions. The space would be first come, first serve in terms of where to set up. If you want more information, email events@odalysirishpub.com! Grab your friends for cocktails and shopping for the Merry Market, a monthly event hosted by the Merry Widow during ArtWalk (2nd Friday) of eah month. Local vendors set up to sell arts, crafts, jewelry, clothing, desserts, bath products and more! Plus a custom cocktail menu crafted each month especially for this event, and available for one night only! Interested vendors: feel free to email info@themerrywidow.net for additional information. However what you mainly need to know is: there is no fee to set up (it’s free! ); set up is at 5:00 PM; please try to break down no earlier than 10:00 PM; and please bring your own change. The Port City Craftsmen are a group of crafters that meet once a month at the West Regional Library in Mobile and looking for new members. Established in November since 1972, the group promotes Arts & Crafts in the Mobile area and puts on a big Arts and Crafts Show every year. Visit portcitycraftsmen.com or facebook page for additional information. Email is portcityaftsmen@yahoo.com or call Ingrid Murdock at 251-649-5705 if interested. Free group open to working artists in the Spanish Fort area. Open studio time, workshops, and meetings scheduled every week on Tuesday from 1 to 3 in the City Hall classroom. Call Claudine Andress at 251-626-6264 for details. Founded in 1914 as the American Institute of Graphic Arts, AIGA remains "the oldest and largest professional membership organization for design and is now known simply as 'AIGA, the professional association for design.'" Area designers are recruiting members to begin a Gulf Coast chapter. If you are interested in joining, visit the group's Facebook page. Applications are now being accepted for fine artists and handcrafters in Mobile and South Mobile County to show and sell their work in the Dauphin Island Gallery on 918 Bienville Blvd. Contact the Dauphin Island Heritage and Arts Council at 251-490-0294 or  email photos of your work to jury@dauphinislandas.org if you want to apply! The Eastern Shore Art Center offers many opportunities to both members and non-members. Members can take part in annual juried and open exhibitions, a bi-monthly sales gallery, the Art and About Program, open studios, and the gift shop and receive discounts on classes and workshops. ESAC puts on two annual outdoor art festivals, features five galleries with shows that rotate monthly, and presents gallery talks, forums and more that are open to the public. To download an exhibit proposal, visit ESAC online. For more details, email Adrienne Falls. The Mobile Art Association is the ideal organization for amateur and professional artists. With over 100 members, MAA provides numerous opportunities to network with and learn from fellow artists. Meetings are on the third Sunday of each month, from September through May, and are held at the Mobile Museum of Art, 4850 Museum Drive, Mobile, AL. The meeting includes a program to provide instruction, critique, and/or “hands on” opportunities to help artists further develop their knowledge and skills. MAA provides a variety of venues and opportunities for members to show their work, including: Spring Member Exhibition, Fall Juried Exhibition, Bi-Annual Juried Exhibit as part of the Shared Expressions Exhibit at the Mobile Museum of Art, and opportunities to show work at local businesses. Visit MAA's website for details and applications. Mobile Arts Council coordinates monthly exhibitions in its offices at 318 Dauphin St., emphasizing work by professional and amateur artists who live (or have lived) in the Mobile Bay area. Shows focus on work by students, emerging artists, artists not represented in a gallery, or established artists moving in a new direction (e.g. a new medium, new subject, new style). The offices feature three exhibition spaces:  the Skinny Gallery and two meeting/conference rooms (the Large Room and the Small Room). Exhibitions are usually displayed from the first Monday of the month through the last Friday. The public is invited to meet the artists from 6 until 9 PM on the second Friday of each month during the LoDa ArtWalk. The offices are open Monday through Friday, 9 AM to 5 PM and usually on Saturday mornings when the Market on Cathedral Square is active. For details on submitting a proposal (or on any other aspects of an exhibition), contact Lucy Gafford. DIY FILMMAKING! A make-your-own-short-film challenge where participants receive guidelines that are specific to each challenge, and a short time period to complete and submit a short film. The guidelines may be technical, thematic and/or based on a required prop, character name or dialogue. The films are usually 5-10 minutes in duration, but the duration and further details of each scramble are TBA at each kickoff/signup event. The resulting entries for each Film Scramble are screened as a late night short film festival at the Crescent Theater in Mobile, AL. Mobile Bay Film Scramble began in 2011 and has offered 2-4 film challenges a year ever since. Find out more on how to get involved on their website! Actor's Edge Studio specializes in theatre classes for all ages and skill levels. Intimate classes will take place on weeknights at the Azalea City Center of the Arts. View the class flyer for full details and scheduling information. No Worries Wednesdays are intended to give actors an opportunity to expand and stretch their skills in a low-risk, no-stress, collaborative situation. For others, it is an opportunity to enhance their personal lives with exposure to stage training. At the end of a session, however, all will have improved their ability to imagine themselves in new situations and respond appropriately. $5 per person. View their page for additional information. Project THRIVE is giving a unique dose of healing to help traumatized victims of violence recover. Launched in September 2018 as a City of Mobile initiative led by the Mobile Police Department Office of Strategic Initiatives, Project THRIVE is joining SouthSounds to offer a songwriter competition. The winners of the competition will receive Project THRIVE recognition and be invited to perform their song on stage at the SouthSounds Music and Arts Festival held April 12 – 14, 2019 in Downtown Mobile. Winning submissions will be released on a Project THRIVE digitally-distributed compilation album. Online submissions are due by March 15! Want to play in a local music festival!? Band submissions are now open for the SouthSounds Music & Arts Festival 2019, taking place in downtown Mobile April 12th - 14th! Apply on their website today. Learn the basics of tumbling and gymnastics while focusing on body control, balance, strength, and flexibility. With yoga techniques added to the gymnastics above, this class will also teach flexibility and body control. Musical Theatre Dance is designed for students to learn multiple musical theatre dance styles: jazz, tap and many Broadway styles based on legendary dance choreographers. Visit their website for full details! Adult ballet, yoga, and more! Classes are offered that range for every fitness level. View their class schedule here! The Dance Academy of Mobile was created in response to an incredible number of requests from parents and students for a new way to experience dance. Our goal is to inspire dancers, young and old, in a caring yet challenging atmosphere. Classes are offered for children and adults in a variety of dance styles: ballet, broadway jazz, contemporary, tap, hula, hip hop, and tahitian dance. View their online schedule for classes and times! Mobile Ballet School is recognized as the region’s foremost dance studio, offering the finest training in classical ballet and jazz. All students in the Mobile Ballet School enjoy exciting performance opportunities, including being on stage in The Nutcracker ballet at the Mobile Civic Center Theater, performing with the Mobile Ballet Company at the Nutcracker Charity Ball, and the year-end Showcase. Auditions are not required to enroll at Mobile Ballet. Each student is evaluated and placed in the correct class to achieve the best results. Visit their website to view the full class schedules and pricing. GCWA is a nationally-recognized organization founded in 1986. Based in the Mississippi Gulf Coast area. GCWA strives to provide opportunities and encouragement for all writers. From individuals who dream of writing their first story or poem, to experienced published authors, GCWA welcomes members whos share the joy of the written word. Visit their website for more information on how to get involved! The Scholastic Awards partners with organizations to offer students Sponsored Awards: special opportunities to receive additional scholarships for works in a variety of categories or dealing with particular themes. The 2019 awards will open on December 1st and January 12th, and deadlines vary by region. The Scholastic Awards look for work that demonstrates originality, technical skill, and emergence of a personal voice or vision. Visit our online galleries to see examples of works from past National Medalists. Public, private, or home-school students in the U.S., Canada, or American schools abroad enrolled in grades 7–12 are eligible to participate in the Scholastic Awards. Visit the website to enter today! The Mobile Writers Guild is an organization of professional and aspiring writers. Anyone is welcome to join their monthly meetings at 6 p.m. every first Thursday of the month (September through May) at the West Regional Library on Grelot Road. February's meeting features a presentation on Indie Publishing and Worldbuilding with Brian D. Anderson. Pre-K through 8th Grade teachers are invited to this free workshop, FOR CHILDREN: Art Across the Curricula, on Saturday, March 30, between 9 AM – 3 PM at the Mobile Museum of Art. This is a SARIC and MMofA-sponsored Teacher Inservice. Earn 5 Professional Development Credits. Sign up online through MMofA's website! The Alabama Arts Alliance, ASCA and ALSDE proudly present the 2019 AL Arts Summit. Interested in attending? View the event flyer for full details! Identify, brainstorm, and propose the redesign of a space in your school by answering these questions. On a separate sheet of paper, draw your design. Have your parent sign the entry form and give to your teacher to submit for the Beautify Your School Sweepstakes. View the website for full details! The Gulf States Chapter of the Society of American Period Furniture Makers will host a Furniture Finish & Spot Repair Seminar at 3600 Pelham Drive, Mobile, 36619. It will take place Saturday, March 9, 2019 from 9 am – 4 pm. Register through here today! The University of South Alabama’s Department of Art and Art History now offer a Master of Fine Arts in Creative Technologies and Practice. The application deadline for Graduate Assistantship is February 15, 2019. The Program Application Deadline for Fall admissions is July 1, 2019. Contact: diane gibbs at gradart@southalabama.edu or call 241-461-1696 if interested. Graduate Student studio space is available on the USA campus in Fairhope, as well as outstanding faculty and facilities on the USA Mobile, Alabama campus in Animation, Art History, Ceramics, Glass, Graphic Design, Painting, Photography, Printmaking, and Sculpture. Visit their website for more information. Join Stewart Heath Gallery for a series of intensive art workshops throughout the months of February and March. Visit their Facebook event page for full details and to register! “All aboard! There’s a place for you in the maritime community!” is an art contest sponsored by the North American Marine Environment Protection Association (NAMEPA), the United States Coast Guard (USCG) and the Inter-American Committee on Ports of the Organization of the American States (CIP-OAS) are welcome. All submissions from students enrolled in grades K-12 living in the Americas (North America, Central America, South America, and the Caribbean). Students living outside the Americas are welcome to apply, provided they have one or more parents on active duty with the U. S. Coast Guard. Submissions will be accepted from January 2, 2019 - March 31, 2019 at 11:59 p.m. Visit their website for full details! Take private art classes in Oils, Acrylics, and Watercolors with William Morris at Saint Luke's Episcopal Church, 1050 Azalea Road. Contact Bill Morris at (251) 404-6980. Cost: 65.00 monthly. Schedule: Tuesdays (9am-12 pm, 1pm-4pm, 530pm-830pm) Wednesdays (9am-12pm and 1pm-4pm) and Thursdays (9am-12pm). Join Marnée's Studio for a number of classes throughout the year. Drawing, painting, figure drawing, and more! BYOB and food for all classes. Visit the Marnée's Studio website for details! Local artists are encouraged to sign up as part of a network (an artist database) that will be shared between the Museum, the Mobile Arts Council, and the Alabama Contemporary Art Center. The goal is to make it easier to provide eager artists with jobs - including teaching, public art creation, professional workshops, and more. Find out what you need to sign up through the TAP checklist. If you want to sign up, click here! Provides members, from beginners to professionals, with educational and skill building opportunities in the art of photography; admission is free and open to anyone interested. Second Thursdays, 6:30 PM. Faulkner State Community College, Centennial Building, School Street and Fairhope Avenue, Fairhope. Call 251-401-0008 for details. Ikebana International of Mobile, Chapter 164 would like to welcome newcomers to their free monthly programming. Workshops take place at the Asian Culture House, 850 Zeigler Boulevard on every first Friday of the month from 10 AM - 12 PM. There, they present many programs, including Japanese floral arranging and gift wrapping. Admission is free! First and third Tuesday, 10 AM – 1 PM. Hosted by the Shibui Chapter of the Sumi-e Society of America. Sessions take place at the Asian Culture House, 4850 Ziegler Boulevard. $2. Eventual membership requested/ $10 annually. Contact Carol Wiggins for questions at carolw2651@comcast.net. Classes for young people, including special needs children, in a variety of disciplines - dance, music, theatre and visual arts. Classes in various arts and crafts for adults and children at a number of venues; see in particular The Art Instructional Center at Lavretta Park. Complete schedule and information. Ongoing and weekly classes for adults and children, workshops and "fun evenings." Complete schedule. Classes and workshops for adults and children. Visit the Center website and click on "Education." For adults - workshops, ongoing classes, and off-site classes; for children and families - after-school classes, spring break art camp, and art for home-schooled children. Visit the Museum website and click on Learn. Mobile Arts Council offers a variety of opportunities for artists and craft-makers to sell their handcrafted goods throughout the year. A monthly event jointly sponsored by the City of Mobile’s Special Events Department and Mobile Arts Council. On this evening, local art galleries, institutions, studios and unique shops open their doors for people to come inside to see beautiful artwork, sample delicious foods and hear the sounds of the LoDa ArtWalk. A map can be located on the bottom of the Special Events webpage here. To display inside a gallery during ArtWalk, please contact that gallery directly. Each year, Mobile Arts Council partners with the City of Mobile’s Special Events Department to produce this market event. Formerly known as Market on the Square, Market in the Park is the same market, located in Cathedral Square in Downtown Mobile. The market features one-of-a-kind arts and crafts produced by local artisans, as well as locally grown produce, seafood, cheese and eggs, honeys, flowers and plants, baked goods, pasta, and more. Add: 1065 Festival Arts and Crafts Market; The 1065 Festival Arts and Crafts Market will take place in Downtown Mobile. This year Mobile Arts Council will be coordinating an arts and crafts market component that will take place on Saturday, September 29 through Sunday, September 30, 2018. Timeframe: 2 PM to 7 PM. Location: Cathedral Square, Downtown Mobile. Vendors are responsible for providing their own 10x10 tent, table, and chairs. SouthSounds Music and Arts Festival will be taking place in Downtown Mobile. This year Mobile Arts Council will be coordinating an arts and crafts market component that will take place on Saturday, April 14, 2018 through Sunday, April 15, 2018. Timeframe: 11:00 AM to 5:00 PM. Location: Cathedral Square, Downtown Mobile. Vendors are responsible for providing their own 10x10 tent, table and chairs. The fourth edition of A Guide to Downtown Art Spaces is now available, listing venues that display original art, both commercial and non-profit organizations devoted specifically to art, as well as businesses for which visual art is an ancillary feature. The brochure lists each venue’s physical address, phone number, website address and hours of operation. It also features a map showing each venue’s location. The project has been coordinated by Mobile Arts Council, which hosts a monthly meeting of representatives of downtown art spaces, open to anyone who would like to be involved. Dee Cariglino (dee c. design) is responsible for the look and layout of the publication, and the printing was provided in part by Optera Creative. Southwind Drum & Bugle Co.